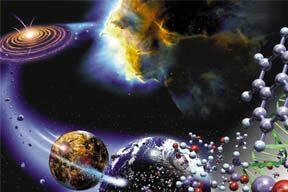 How life may spread throughout the Galaxy. 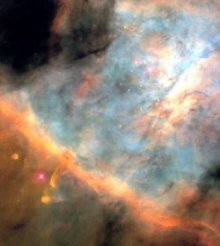 Complex molecules can form in molecular clouds such as this one in Orion. Panspermia is an idea, with ancient roots, according to which life arrives, ready-made, on the surface of planets from space.1 Anaxagoras is said to have spoken of the "seeds of life" from which all organisms derive. Panspermia began to assume a more scientific form through the proposals of Berzelius (1834), Richter (1865), Thomson (Lord Kelvin) (1871), and Helmholtz (1871), finally reaching the level of a detailed, widely-discussed hypothesis through the efforts of the Swedish chemist Svante Arrhenius. Originally in 1903,2 but then to a wider audience through a popular book in 1908,3 Arrhenius urged that life in the form of spores could survive in space and be spread from one planetary system to another by means of radiation pressure. He generally avoided the problem of how life came about in the first place by suggesting that it might be eternal, though he did not exclude the possibility of living things generating from simpler substances somewhere in the universe. In Arrhenius's view, spores escape by random movement from the atmosphere of a planet that has already been colonized and are then launched into interstellar space by the pressure of starlight ("radiopanspermia"). Eventually, some of the spores fall upon another planet, such as the Earth, where they inoculate the virgin world with new life or, perhaps, compete with any life-forms that are already present. Arrhenius's ideas prompted a variety of experimental work, such as that of Paul Becquerel, to test whether spores and bacteria could survive in conditions approximating those in space. A majority of scientists reached the conclusion that stellar ultraviolet would probably prove deadly to any organisms in the inner reaches of a planetary system and, principally for this reason, panspermia quietly faded from view-only to be revived some four decades later. In the early 1960s, Carl Sagan analyzed in detail both the physical and biological aspects of the Arrhenius scenario. The dynamics of a microorganism in space depend on the ratio p/g, where p is the repulsive force due to the radiation pressure of a star and g is the attractive force due to the star's gravitation. If p > g, a microbe that has drifted into space will move away from the star; if p < g, the microbe will fall toward the star. For a microbe to escape into interstellar space from the vicinity of a star like the Sun, the organism would have to be between 0.2 and 0.6 microns across. Though small, this is within the range of some terrestrial bacterial spores and viruses. The ratio p/g increases for more luminous stars, enabling the ejection of larger microbes. However, main sequence stars brighter than the Sun are also hotter, so that they emit more ultraviolet radiation which would pose an increased threat to space-borne organisms. Additionally, such stars have a shorter main sequence lifespan, so that they provide less opportunity for life to take hold on any worlds that might orbit around them. These considerations, argued Sagan, constrain "donor" stars for Arrhenius-style panspermia to spectral types G5 (Sun-like) to A0. Stars less luminous than the Sun would be unable to eject even the smallest of known living particles. "Acceptor" stars, on the other hand, must have lower p/g ratios in order to allow microbes, approaching from interstellar space, to enter their planetary systems. The most likely acceptor worlds, Sagan concluded, are those circling around red dwarfs (dwarf M stars), or in more distant orbits around G stars and K stars. In the case of the solar system, he surmised, the best place to look for life of extrasolar origin would be the moons of the outer planets, in particular Triton. Many variations on the panspermia theme have been put forward. William Thomson (Lord Kelvin) proposed that spores might travel aboard meteorites ("lithopanspermia"), thus affording them better protection from high-energy radiation in space. Whether events violent enough to hurl rocks from the surface of a biologically active planet into interstellar space ever occur is not clear. But there is now overwhelming evidence that ballistic panspermia occasionally operates between worlds of the same planetary system. This follows the discovery of meteorites on Earth that have almost certainly come from the surface of Mars (see SNC meteorites) and the Moon. There is also controversial evidence for fossil remains aboard some carbonaceous chondrites, including the Orgueil meteorite. In the 1960s, Thomas Gold pointed out another way in which life might travel from world to world (see "garbage theory," of the origin of life). A team of explorers from an advanced, interstellar-faring race might land on the planet of a foreign star and, unwittingly, leave behind "bugs" which then adapt to the local conditions. He imagined, for example, the visitors having a picnic and not clearing up afterward. What effect microscopic alien fauna and flora might have on the indigenous species is impossible to predict, but such considerations were foremost in the minds of scientists receiving the first samples of rock and soil from the Moon. Precautions against alien contamination will be even more important when the first spacecraft return from Mars or Europa where the possibility of extant life is far greater ( back-contamination). And there is the reverse problem (forward-contamination). The remarkable case of Surveyor 3 makes it clear that some terrestrial microbes can survive for significant periods in hostile conditions on other worlds. What if such a world (like Mars) had life-forms of its own? What chaos might the "alien" microbes from Earth wreak? It would be tragic indeed if the very means of discovering the first examples of extraterrestrial life were also to be the vehicle of its extinction. On the other hand, as Carl Sagan pointed out, if Gold's "picnic scenario" had actually happened in the Earth's past "some microbial resident of a primordial cookie crumb may be the ancestor of us all." Just as the chance of accidental contamination arising from intelligent activity cannot be ruled out, there is the complimentary possibility of intentional or directed panspermia. Today, the panspermia hypothesis has finally achieved some measure of scientific respectability. Although it remains the orthodox view that life evolved in situ on this world and, possibly, many others, there is mounting evidence of at least some extraterrestrial input to the formative stages of planet-based biology. Prebiotic chemicals have been detected in interstellar clouds (similar to that from which the Solar System formed), comets, and meteorites (see astrochemistry). At the very least, it seems that some of the raw ingredients for life, such as amino acids, may have fallen from the sky in addition to being manufactured here on Earth. But some researchers have gone much further in their speculations. Most notably, Fred Hoyle and Chandra Wickramasinghe have argued persistently since the 1970s that complex organic substances, and perhaps even primitive organisms, might have evolved on the surface of cosmic dust grains in space and then been transported to the Earth's surface by comets and meteorites (see life, in space). The extraordinary durability of some extremophiles, bacterial spores, and even exposed DNA, lends credence to the view that simple life-forms may have originated between the stars or been capable of surviving long interstellar journeys. 1. Kamminga, H. "Life from Space - A History of Panspermia," Vistas in Astronomy, 26, 67 (1982). 2. Arrhenius, S. "The Propagation of Life in Space," Die Umschau, 7, 481 (1903). 3. Arrhenius, Svante. Worlds in the Making: The Evolution of the Universe. New York: Harper & Row (1908).